Synopsis: Why do we lose our ability to feel great? And what is 'feeling great' anyway? Is it really possible to feel great in today's world where every day there is some new crisis or disorder? Some new upheaval or unexpected negativity? Where violence is rife? Is feeling great out of place or insensitive to the reality of many people's lives? In this treasure of a book, Janki and Vegso call on their decades of spiritual study and practical experience to answer these and other essential questions. You will learn what it really means to 'feel great' and it might not be what you expect. You will discover that feeling great is not about having a good time for a few hours, or having money to spend. It's about putting your life in order and remembering who you really are. It's about practicing the four keys revealed in this book enthusiasm, optimism, contentment, and respect then learning how to start acquiring and applying them. Janki and Vegso's rich descriptions of the sticking points we encounter on our journey through life demonstrate how we can recover our ability to truly feel great not as a temporary indulgence, but as a lasting state of being. Now is the time to start feeling great, and this uplifting book shows you how easy it can be. Peter Vegso is an entrepreneur and pioneer of self-help publishing, best known for being the original publisher of the Chicken Soup for the Soul series. Vegso has been having a diverse and open dialogue with God for most of his life. His appreciation of Dadi Janki and the mission of the BKWSU led them to this special collaboration. Originally from Canada, he has spent the last 30 years in Boca Raton and Ocala, Florida, where he enjoys life with his wife of 40 years, Anne, their children and three very active grandsons. Dadi Janki is a woman of wisdom. Her life's journey has been a fulfillment of her early childhood longing to know and come close to God. Dadi was born in 1916 in India to a devout and philanthropic family. She had no formal education beyond the age of fourteen, her studies being mainly of the scriptures. At the age of twenty-one she joined the Brahma Kumaris World Spiritual University and has dedicated her life to the spiritual service of others. Disregarding the constraints of social conventions including the caste system, Dadi Janki became one of the few active women spiritual leaders just following India's independence, traveling throughout India, teaching self-reliance and empowering women to become leaders in their communities. Her concern for the well-being of others has always been a driving force in her life. Much of her youth was spent in serving the sick by comforting them with religious stories and humble prayers. Indeed, her own life has been filled with illness, which tested and helped her to develop her own ability to conquer physical infirmity through greater spiritual awareness. Dadi campaigns for truth and works tirelessly for world peace. She travels worldwide, teaching and sharing her wisdom and deep spiritual knowledge. She is a soul who refuses to set limits and boundaries as to what is achievable and, in so doing, inspires other to believe that they, too, can make the impossible possible. Recognized worldwide for the depth and insight of her lectures and spiritual classes, her words of wisdom have given wings to countless souls. Since arriving in London in 1974, Dadi has overseen the expansion of the Brahma Kumaris' work in more than 70 countries and is now the university's co-administrative head. Dadi is one of the Wisdom Keepers, an eminent group of spiritual leaders convened at United Nations conferences. She is also founder and president of the Janki Foundation for Global Health care and vice president of the World Congress of Faiths. The Brahma Kumaris World Spiritual University's purpose is to help people explore their highest level of personal integrity and the attributes of leadership. This unique method of education in human moral and spiritual values was initiated in 1936 and is currently offered in over 70 countries. Kelly Johnson has worked in the publishing industry for many years reading, selling and marketing other people's books. 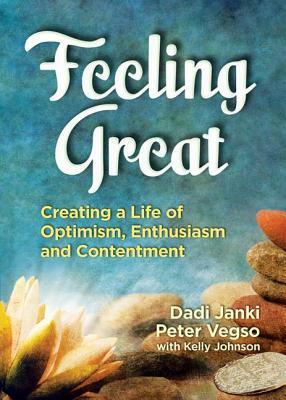 When the opportunity to write Feeling Great with Peter Vegso and Dadi Jankli came along, it was an unexpected honor. Johnson gratefully lives near the sea in Satellite Beach, Florida, writing and doing the work she loves. Review: I must admit I'm always skeptical of self help books. Many are preachy, or ramble on without really offering any concrete advice, preferring to stumble around in vague references to ethereal beings and ideas. This book is not only easy to read, bu t insightful and informative. It feels like the author is speaking to the reader as friend, not lecturing the reader like a parent would a recalcitrant child.